Wide variety of sizes and shapes available. Many of Agriculture’s monitors are equipped with RAM Mounts, we liked them so well we became RAM dealers! RAM Mounts allow you to put items where you need them most. Your monitors, laptop and net books handhelds, cell phones and even cup holder can be set up to give you easy access and stability. 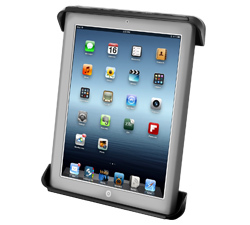 No more fumbling, dropping, or struggling to reach and use equipment or gadgets. Protect your investment and make it easier to use your equipment with RAM Mounts from Martens Farms. We carry most RAM products, below you’ll see just a few examples of the many RAM items available. Call us today, we will help you find the best product for your need. The RAM-101U consists of a double socket arm and two 2.5″ diameter round bases that contain the universal AMPS hole pattern. The mount is designed with a 1.5″ diameter patented rubber ball and socket system that has adjustment points at both ends of the double socket arm; this allowing for almost infinite adjustment and perfect viewing angles. The hole pattern found on the round base adapter will connect to many RAM cradles, including all iPad cradles. The included RAM’s patented design dampens shock and vibration, helping to extend the life of your device. The “U” in the part number reflects product packaged in poly bag. If you prefer a smaller double socket arm with two round bases, RAM recommends the (RAM-B-101U). The RAM-101U-2461 consists of a double socket arm, 2.5″ diameter round base with the universal AMPS hole pattern and 3.625″ square plate with the VESA hole pattern. The VESA plate contains a 75mm X 75mm hole pattern. Designed into the mount is a 1.5″ diameter patented rubber ball and socket system with adjustment points at both socket ends of the arm. Rubber ball and socket technology allows for almost infinite adjustment and perfect viewing angles. The RAM-101U-D consists of a long double socket arm and two 2.5″ diameter round bases with the universal AMPS hole pattern. Designed into the mount is a 1.5″ diameter patented rubber ball and socket system with adjustment points at both socket ends of the arm. Rubber ball and socket technology allows for almost infinite adjustment and perfect viewing angles. High quality materials insure your device is safe, secure, and within easy reach. RAM’s patented design also dampens shock and vibration helping to extend the life of your device. The “”U”” in the part number reflects product packaged in poly bag. For additional specifications, see components and drawings tabs. The included plate is a universal mounting bracket with a selection of mounting hole locations. In certain applications additional holes may need to be drilled for proper fit with your electronic device. The RAM-111U consists of a double socket arm, 2.5″ diameter round base and 6.25″ x 2″ rectangle base. The round base contains pre-drilled holes, including the universal AMPS hole pattern. The rectangle base contains different combinations of pre-drilled holes which will match up to many electronic devices and mounts, including Marine GPS, CB Radios, Ham Radios, Gimbal Brackets and more. Note: The “U” in the part number reflects product packaged in poly bag. The 6.25″ x 2″ rectangle base is a universal mounting bracket with a selection of mounting hole locations. In certain applications additional holes may need to be drilled for proper fit with your electronic device. Note: The “U” in the part number reflects product packaged in poly bag. Mounting hardware not included with purchase. The RAM motorcycle handlebar base contains a 1.5″ rubber ball designed to sit at right angles to the mounting rail. The rust proof metal u-bolt accommodates rails in diameter from 0.5″ to 1″ in diameter. The base also includes black cover caps to be placed over the exposed ends of the u-bolt. Accommodates rails from 0.5″ to 1″ in diameter. Part number reflects product packaged in clear clam shell for store shelf display. The Tough-Tray™ is compatible with laptops that have 17″ screens. The RAM-235U consists of a stainless steel double u-bolt base connected to a 1.5″ diameter ball. The double u-bolt base will accommodate rails from 1″ to 1.25″ in diameter. The “U” in the part number reflects product packaged in poly bag. This mount includes stainless steel u-bolts for preventing rust of the mount and black cover caps to be placed over the exposed ends of the u-bolt. The powder coated marine grade aluminum base contains a 1.5″ diameter rubber ball connected at right angles to a 1.25″ x 2.5″ inch diamond plate. The base has two holes 1.912″ from center to center, positioned at both ends of the diamond base. This RAM-2461U consists of a 1.5″ rubber ball, connected to a 3.625″ square plate with a 75mm X 75mm VESA hole pattern. The rubber ball is positioned 0.88″ from the center of one edge. The RAM-316-1AU consists of the RAM POD I universal No-Drill™ vehicle base, 18” rigid aluminum rod and composite button connection to attach single socket arms. The base of the mount connects to your seat rail without any drilling necessary. The 18″ rigid aluminum rod can be bent to position your device to its optimum viewing location. Components to connect to the button end include the RAP-B-200-1U, 1″ single socket arm, or theRAP-200-1U, 1.5″ single socket arm. Both of these short arms will convert the button end to a single socket arm. 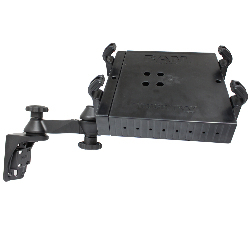 This universal base allows you to mount a laptop or any other in car device safely and securely. Part number reflects product packaged in clear clam shell for store shelf display. For additional specifications, see components and drawings tabs. The RAM-B-101U-A consists of a SHORT double socket arm and two 2.5″ diameter round bases that contain the universal AMPS hole pattern. The mount is designed with a 1″ diameter patented rubber ball and socket system that has adjustment points at both ends of the double socket arm; this allowing for almost infinite adjustment and perfect viewing angles. The hole pattern found on the round base adapter will connect to many RAM cradles, including all iPad cradles. The included RAM’s patented design dampens shock and vibration, helping to extend the life of your device. The RAM-B-103U consists of a 2.5″ round base and double socket arm that will accept 1″ ball bases. The round base contains pre-drilled holes, including the universal AMPS hole pattern. Designed into the mount is a 1″ diameter patented rubber ball and socket system with adjustment points at both ends of the socket arm; this with a twist of the arm knob allows for you to maneuver the mount to your optimum viewing position. The RAM-B-108B-STRAP40U accommodates rails from 2″ to a maximum of 3″ in diameter. To mount the RAM-B-108BU base, place the saddle shaped plate on the rail then wrap the metal clamp strap around the rail and plate. Tighten the screw knob on the metal strap with a screw driver until the strap has a firm hold on the rail. The RAM-B-108BU is an alternative mounting base for aircraft such as the Bonanza or Beech with a “throw over yoke”. The RAM-B-111BU consists 1″ diameter rubber ball connected to a flat 6.25″ x 2″ rectangle base. The base contains different combinations of pre-drilled holes which will match up to many electronic devices and mounts, including Marine GPS, CB Radios, Ham Radios, Gimbal Brackets and more. The “U” in the part number reflects product packaged in poly bag. This plate is a universal mounting bracket with a selection of mounting hole locations. In certain applications additional holes may need to be drilled for proper fit with your electronic device. The RAM-B-121-202U consists of a double socket arm, round 2.5″ base that contains the universal AMPs hole pattern and yoke clamp base. The clamp base will accommodate rails in diameter from 0.625″ to 1.25″. The 1″ rubber ball is at a right angle to the plane of the mount so when connected to a rail, the ball sits parallel to the rail. This mount is designed to be a universal mounting solution for both RAM and non-RAM designed products. The rail does not need to be perfectly round to mount this base. The RAM-B-201U-A, short double socket arm, has a socket at both ends that accommodates 1″ ball bases. RAM socket technology allows for almost infinite adjustment and perfect viewing angles. Note: The “U” in the part number reflects product packaged in poly bag. The RAM-B-202U will attach to any RAM composite cradle; however, the RAM-B-238U is most commonly used. Accommodates rails from 1″ to 1.25″ in diameter. The RAM motorcycle handlebar base contains a 1″ rubber ball designed to sit at right angles to the mounting rail. The rust proof metal u-bolt accommodates rails in diameter from 0.5″ to 1″ in diameter. Included are black cover caps to be placed over the exposed ends of the u-bolt and a composite adapter that can narrow the rail to a minimum width of 0.5″. The RAM-B-235U consists of a stainless steel double u-bolt base connected to a 1″ diameter ball. The double u-bolt base will accommodate rails from 0.5″ to 1.25″ in diameter. The RAM-B-238U consists of a 1″ diameter rubber ball connected at right angles to a 2.43″ x 1.31″ diamond base. The base has two holes 1.912″ from center to center, matches the industry standard AMPS hole pattern and will connect to a large variety of RAM Mount and third party cradles. Buy RAM-B-309-1U 1 inch Ball with Motorcycle Brake/Clutch Reservoir Base. The “U” in the part number reflects product packaged in poly bag. The cradle includes a set of two nuts and bolts to connect the cradle to any of the RAM compatible mounts. RAM cradles do not include the RAM-B-238U(Diamond Base & Ball) or RAP-B-238U (Diamond Composite Base & Ball), required to attach to the cradle and RAM mounting system. The RAP-105-6D224U consists of a 3.25″ suction cup locking base, 6″ flex arm and diamond base end. The suction cup base is designed to have a strong hold on glass and non-porous plastic surfaces, including RAM adhesive disks. The hole pattern found on the diamond base adapter will connect to most RAM cradles.Material: High Strength CompositeNotes: The “U” in the part number reflects product packaged in poly bag.